Any Economics student at Delhi University who has done a modicum of reading about history of economic thought shall be able to see that Economics as an academic discipline is dominated by Neoclassical Economics, with some Keynesian Economics here and there. And this is true for Universities all over the world. From the very first class, we are fed “Ten Principles of Economics” from Gregory Mankiw’s book like they are supreme laws of nature, followed by rigorous mathematical analysis of demand and supply, of markets, of consumption and production, et-cetera. The schools of macroeconomic thought enter the picture in the fourth semester where they are given, generally, as much attention as agriculture gets from mainstream media. One reason is also their low share in the marking scheme of semester examinations. I believe, the most appropriate way to learn a social science subject is to approach it historically. Because each distinct theory has to be seen in its historical context to be understood completely. For natural sciences, the laws are pretty much timeless. But Economics, despite of such rigorous mathematics used in its study, is a social science; and we need to study each theorist (economist) in the light of times he/she lived in. For this, the ‘Economic Schools of Thought’ should be the very first chapter in Economics syllabus at DU. This shall guide students to see that each economist was a product of its time, that Economics developed in many ways from many different ideas about human nature and social constructs. For example, a deeper reading of neoclassical economics shows that it stems out from the philosophy of ‘Humanism’ and Keynesian Economics has an element of ‘Structuralism’. If nothing else, this might introduce students to the plurality of Economics right at the beginning, so that we at least know that there is more to economics than unrealistic assumptions in the name of ceteris paribus. When we are fed equations and assumptions about consumer behavior, demand, and supply, investment, growth etc. like they are foolproof equations of natural sciences, the introduction of schools of thought in the fourth semester doesn’t do much to expand our horizon of understanding. It’s almost as if things would be same without such an inclusion. Post financial crisis, there have been numerous critiques of neoclassical economics, of the financial system, the banking system, of capitalism itself. But despite everything, there have been no major reforms in the syllabus of Economics at universities in India. If we look at the syllabus of Economics Honours before CBCS in Delhi University, we shall see that the foundation subjects of theory are still exactly the same. We are still fed the same ‘laws’ and ‘principles’ of neoclassical economics until we are programmed to accept them as absolute truths rather than just one interpretation of reality amongst many others. At this point, it must be made clear that neo-classical economics is not an altogether wrong branch of economics. The ‘free market – rational individual – independent agents’ formulations of economic theories do give many useful insights about the economic phenomena around the world. And these models are extremely feasible to base research on. The problem arises when we never learn to question those theories any further than some of the questions raised by John Maynard Keynes. The problem arises when our tendency of ‘not questioning’ translates into single-mindedness about the supremacy of one theory. When global events have repeatedly proved many neo-classical models and theories to be faulty and at times, even misguided, why do we still study the same syllabus without even looking at it critically? We study textbooks written primarily by American authors – or authors who are not American but reside in America. In the process of learning to solve problems that concern advance capitalist economies, we become arrogant ‘specialists’ who are very prone to giving first world solutions to third world problems. While I am a second-year student and there are two semesters on Development Economics and Indian Economy in the third year, I doubt, with my neo-classical training in theory, how much I would really be able to grasp the problems by their roots concerning India. Or will I just see the problems as much as they are written in my readings, as most of us do? I am certain that there are others like me who feel that there is a huge problem with Economics as an academic discipline here in India and across the world. We study such a plural subject by almost reducing it to singularity. The notion of an inherently stable economy is fit into our minds like a testament. But during class, while learning the models like the Walrasian Equilibrium, the Efficient Market Hypothesis, our mind is constantly confused from the fictionality of the premises of those models. It is completely true that the arrival of Economics as a mainstream distinct academic discipline began with the Classical Economists’ works, like those of Adam Smith, David Ricardo, Jevons, Walras, Vilfred Pareto etc. It is absolutely necessary to study these giant intellectuals and their theories to learn economics. But we must also notice that neo-classical economics did not really build beyond providing a mathematical proof of earlier theorems under certain assumptions, while the world, clearly, has changed a lot. And when the models developed by top neo-classical experts around the world (including Nobel Laureates) have failed (sometimes very miserably) time and again in predicting as well as averting financial crashes, we must now collectively call for reform. I strongly advocate the inclusion of Neo-Classical Economics in undergrad syllabus, because we can’t do anything without it. But I am sternly against the dominance of one branch in academia, politics and the financial sector. We must be introduced to Marx, to the Austrians, to the causes of various financial crashes and where the neo-classicals went wrong. We must be taught the problem of ‘Unequal Exchange’ as proposed by Samir Amin as importantly as we are taught the PPP theory. Because the way we are going right now, according to me, we shall become arrogant self-proclaimed specialists who think they know more than the laymen and understand the world, but lack the basic element of ‘intellectual plurality’. We must also be taught, as an additional Skill Enhancement Course, about the day to day working of Banks and Financial Institutions in India, about things as basic as how to buy insurance policy or how to manage our bank accounts. Things very basic, but extremely relevant to the real world. I have noticed that I know complex things like how Banks galvanize the credit-creation process, but not so much the simpler things which really matter in day to day survival. The purpose of my education in Economics, for me, is to be part of a global intellectual workforce, who pioneer in bridging the gap between complex economic phenomena and the common people. The world is a complex place, extremely difficult to understand. As economics students, our goal must be to make it simpler for everyone. We must learn to rigorously criticize our own discipline, because at this crucial juncture in history, Economics needs it. Alyasa Abbas is a second-year student of Economics Hons. 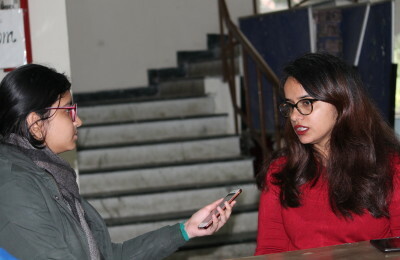 at Zakir Husain Delhi College.